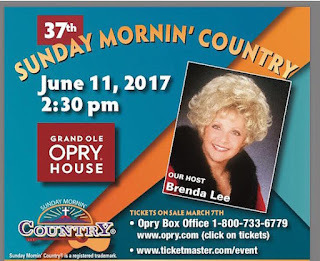 2017 Sunday Mornin' Country with Brenda Lee On Sale Today! Sponsored by the Nashville-based nonprofit, Music City Christian Fellowship, leaves its Fans & Guests with an uplifting memory of Nashville that will last a lifetime! Celebrating 36 years, "Sunday Mornin' Country" is the longest running named Country/Gospel event associated with the week of CMA Music Fest/Fan Fair. All of the Artists volunteer their performance and all proceeds from the admission price go toward the venue and production costs incurred. Tickets: $27 on-sale here on Tuesday 3/7 at 10 AM CST!